I love short stories. They are perfect to read after those heavy reads that take a lot out of me as a reader. 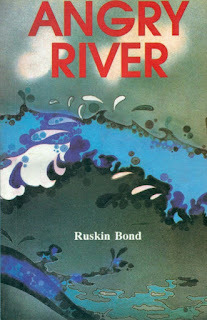 On that front, I think Ruskin Bond’s books excel. I admire the author a lot for his simplicity. I found this book at the library and just the title alone made me wonder what it had in store. Angry River shares the story of Sita, her small family consisting of her grandmother and grandfather, and their life on an island at the middle of the big river. The river floods when her grandparents aren’t around, leaving Sita in a dilemma. The story, I feel, is one about hope and faith. Sita’s seemingly simple and happy life is disrupted by the flood, but the girl, who has grown up near the river and hearing of its tale from the grandparents, continues to be hopeful. She tries to survive, rather than get panicked. The story, on its face, is a simple one. There aren’t any unexpected twists and turns, and neither does the storyline call for one. It’s engaging in its brevity too. There are just four or five characters through the story, but the focus is the young girl and her struggle during the flood. Her innocence is well portrayed, as is the fact that the stories she has heard is from her grandmother. This in turn is reflected in her imagination. I remember the stories of Krishna, Sita and others from Indian mythology being shared with me by my grandmother as I was growing up. It’s the same with Sita, and that is something beautiful. This book is a quick read, and a beautiful one. I would definitely read it again, even if just to take a break from the longer length stories/novels around. Reviewed by Vinay Leo R. No payment was taken for this review; these are the unbiased and uninfluenced thoughts of the reviewer about the book.